From compact, servo driven gantry robots to articulated arm robot cells and high speed, multi-lane layer palletising systems, Goliath has a palletising solution to suit your budget, available floorspace, product type & output requirements. 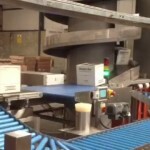 This compact, versatile robot picks products from an in-feed conveyor and precisely places onto the pallet. 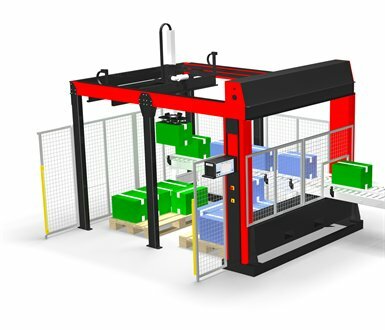 The gantry robot is quick and easy to install in an existing production environment, being fully factory tested before delivery using your pre-supplied products and pallet patterns. With cutting-edge IPC control, it takes no more than 30 seconds to switch to a previously saved palletising programme, while new pallet patterns can be quickly generated using optimisation software such as CAPEPACK®. 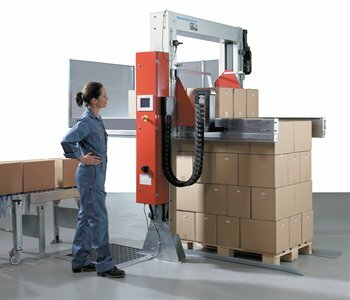 The Gantry Robot, which is available with single, double or multiple palletising positions within a single framework, requires minimal maintenance, is easy to access and is delivered equipped with safety fencing and interlocked access door(s) to ensure operator safety and meet CE requirements. All types of cases, even heavy and bulky ones, can be stacked to 2700 mm load height in order to fully maximise your shipping efficiency. Offered by Goliath where the gantry robot is deemed less suitable, the articulated arm robot is a tried & trusted solution to your higher speed single or multi-lane palletising requirements onto one or more pallets. Generally rated at up to 20 cycles/minute at 160Kg maximum payload, the articulated arm robot is a heavy-duty solution to your more demanding applications. Offered where the gantry or articulated arm robot may not suit the particular process requirements, the Layer Palletiser supports the underneath of the product at all times during row & layer formation stages & also during the critical product transfer stage to the adjacent pallet. Cartons are pushed by an operator directly onto the stripper plate of the pallet loader according to the desired pattern. With high speed and multi-lane palletising capabilities, the Layer Palletiser is a reliable partner in a busy production environment. Products handled include cases, sacks, trays, drums, buckets etc. Goliath works with international partners to bring the best palletising solutions to the Irish marketplace! Goliath recently installed an Automatic Conveying, Collating and Cartoning System designed to handle 136 juice packs per minute. Packs are stacked, inverted and collated in to 4’s before automatic cartoning, gluing and return to upright position. This is another example of Goliath’s expertise in automated product handling and successful project delivery. Hi speed check weighing & reject system recently installed at a major Irish beverage company, handling up to 45 boxes per minute (max box weight 30kg). © 2019 Goliath Packaging Systems Ltd.